With the entrance of the Yamaha FZ-16 and Yamaha R-15, the India two-wheeler market scenario has been transformed and taken to another and certainly a much better level. Earlier where it was only a dream for bikers to buy a stripped down version of a performance bike, now has been drastically changed. For the Indian market the most important thing to keep in mind is the price tag and one can only offer performance bikes at affordable prices by stripping down some of their features. The trend was brought by Yamaha and is being followed by a number of brands like Kawasaki, Honda, Suzuki and now KTM. A few days back KTM had confirmed of launching its new KTM Duke 125CC in India which is now being joined by another word coming from the company’s headquarters in Mattighofen in Austria. 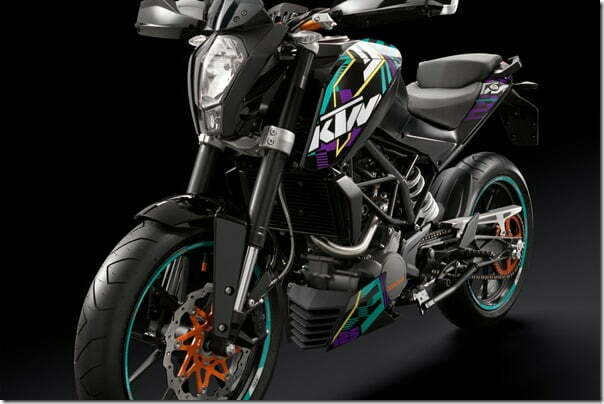 The company is planning to launch another 200CC version of the same in European and Indian market. Comparing the bike to its 125CC sibling the is expected to pump at least 28 to 30 BHP of power with its 200CC heart. It will be heavier than the former and probably be more stable. This new baby will sport the same features as coming with the 125 Duke except for the engine part which will play a very important role in the bikes performance. As the KTM 125 is expected to be priced at a little above Rs.1 Lakh, the KTM 200 will be priced around 2 Lakh so as to compete with the Honda CBR250R, Kawasaki Ninja 250R and the very recent Mahindra Mojo.